Mafé Brooks is the Director of Development of FSU's College of Communication & Information. 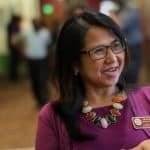 Before this position, she was the Director of Development of the College of Information and University Libraries and served as the Annual Giving Development Officer for FSU's Undergraduate Studies-Honors Program and the College of Medicine. Prior to her career in the development field, she worked in the international education field and served as the Assistant Director for Programs & Development at FSU's International Center. Her educational background is in Linguistics, Education and Teaching English as a Second Language. Her professional affiliations include the Council for Advancement and Support of Education (CASE) and the Association of Fundraising Professionals (AFP). Mafé is passionate about giving back to the community so she is involved with a few local non-profit organizations and has served on the board of the Character & Heritage Institute, the Big Bend Filipino-American Association, the Asian Coalition of Tallahassee, Literacy Volunteers of Leon County, and the March of Dimes.